Impressionism is often seen as an exclusively European movement, dominated by the likes of Monet, Degas and Manet. 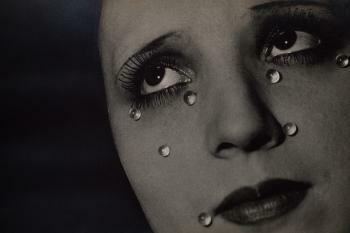 A new exhibition at the National Gallery pushes these Europeans into the background. 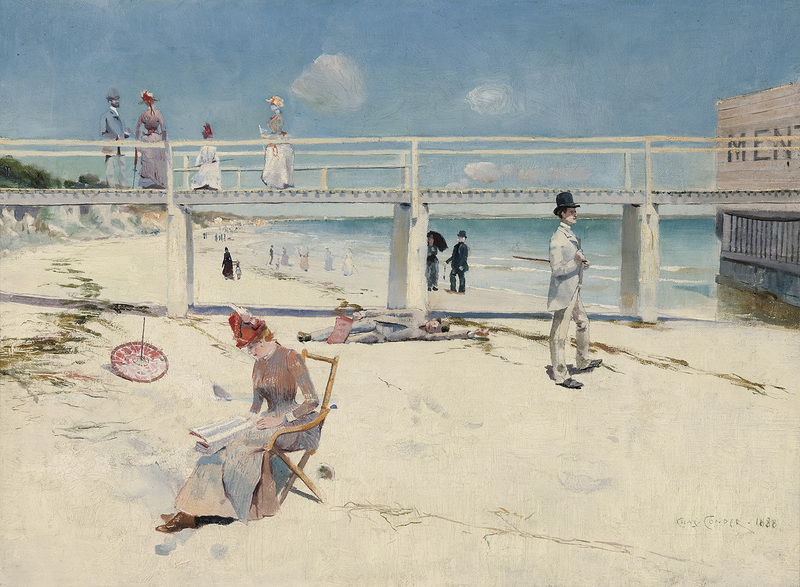 “Australian Impressionists” shows a group of Australian painters who used the impressionist techniques emerging from Europe – like plein-air painting and the experimental use of colour and light – to pioneer a new way of picturing their homeland. The exhibition is comprised of over 40 works by four artists: Arthur Streeton, John Russell, Tom Roberts and Charles Conder. In their street scenes and epic landscapes, Australians could see Australia in a new way. Spanning two decades, the exhibition begins in 1884, almost a hundred years after the first British settlers arrived, and culminates in 1904, three years after independence. As nationalism swept Australia, landscapes by Roberts, Conder and Streeton – the founders of Australia’s first school of painting, the Heidelberg School – transformed how the new nation was visualised at home and abroad. They painted Australian subjects, from a jackaroo herding sheep to a bustling Melbourne street, and upgraded from modest sketches on the backs of cigar cases to epic pastoral landscapes. Streeton’s “The Purple Noon’s Transparent Might” – a sun-drenched canvas of Hawkesbury river and the Blue Mountains – struck a chord with art critics in 1896, including one who celebrated the way its green fields, stretching all the way to the horizon, seemed to suggest that even the “remotest distances were in touch”. John Russell is the odd one out in the exhibition. Though he was born in Australia, he lived in Europe for over 40 years. He was a friend of Monet and Matisse and in his paintings he used frenzied brushstrokes and vivid colours (he once talked of “chasing colour”) to create dazzling, experimental paintings of the sea off the coast of France or the mountains of southern Italy. His passion for the European landscape came at a cost: he became estranged from his friends in the Heidelberg School, and is often omitted from Australia’s art history because his work is considered too internationalist. 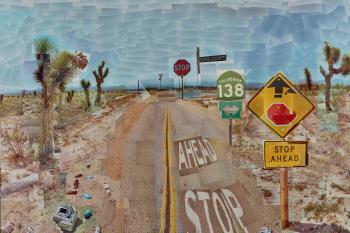 In 2013 the Royal Academy did not include him in their survey of Australian art. However, Russell was not the only painter to be indebted to international modernism: Conder and Roberts frequently travelled to Europe, where they discovered the work of artists like James Abbott McNeill Whistler and Jules Bastien-Lepage. 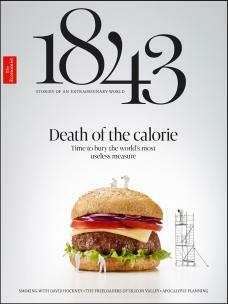 Their work took on a decidedly international flavour. Melbourne was fast becoming one of the most populous cities in the British Empire. This busy street sizzles with the heat of the midday sun. Carriages kick up clouds of dust; an ice cart appears like a mirage. 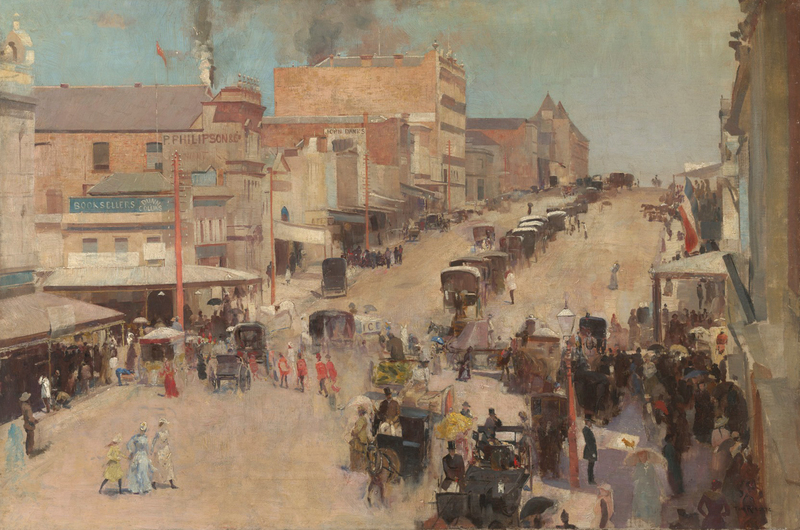 Roberts employs the “glare aesthetic”, a common impressionist technique, to capture the intensity of the Australian sun: in the top left corner of the painting, the sunlight makes it seem as if the buildings are melting into the sky. Roberts also had a knack for painting lively crowd scenes. Here his rapid brushstrokes convey the hurried movement of people as they scurry across the street or take refuge from the sun beneath shop awnings. His thick layering of oils lends the crowd a lifelike density, but in the throng you can discern faces, hats, parasols – even a little brown dog. Roberts captures the currents of the city without losing sight of the people caught within them. Conder populates his beach study with day-trippers belonging to Melbourne’s leisure class to create a cosmopolitan scene of the popular, upmarket suburb of Mentone. The colours are light and airy, though Conder’s figures are almost absurd: the posture of the top-hatted gentleman looking wistfully out to sea is excessively formal, while the man sleeping on the sand (possibly Streeton) is strangely stiff. 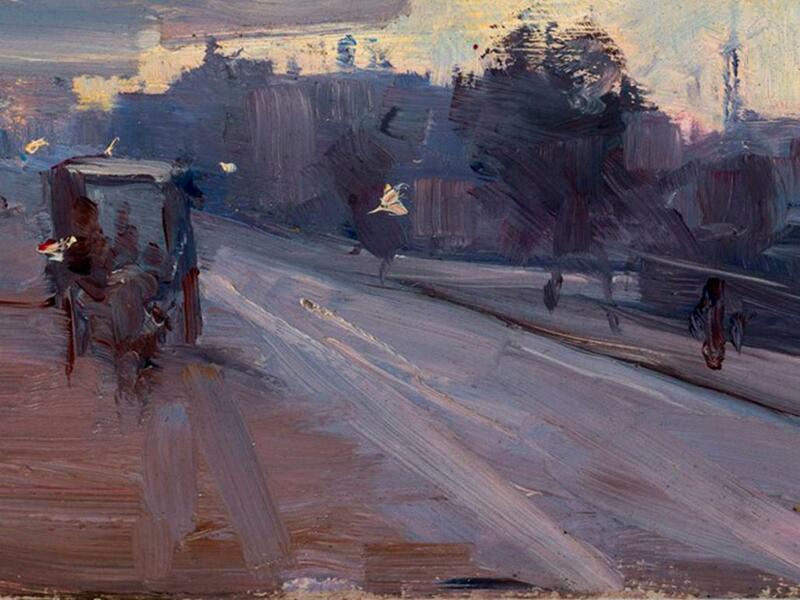 This small-scale sketch captures at speed the fading light as dusk settles over a Melbourne suburb. It takes its cue from Whistler’s small but evocative sketches, which use the same techniques – a dark palette and loose brushwork – to capture the atmosphere of the River Thames and Embankment in London. Roberts saw Whistler’s sketches while he was studying in London and he brought news of them back to Streeton in Australia. They would inspire the “9 by 5 Impression Exhibition”, which brought the impressionists to public attention in Australia in 1889, and which included this sketch. The exhibition’s title derived from the dimensions of the small cigar cases that the Heidelberg artists often carried around with them and used as canvases to record their impressions of their surroundings. A group of labourers building a tunnel though the Blue Mountains, west of Sydney, set off dynamite. 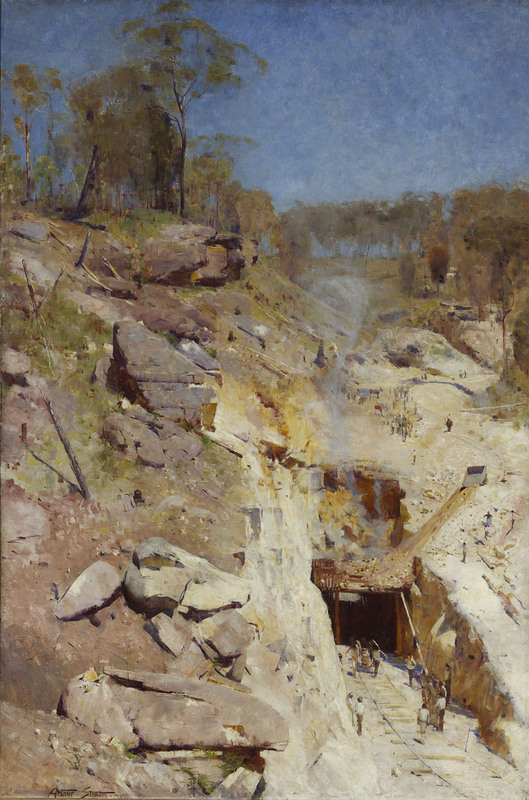 Streeton had intended to paint a simple scene of the navvies at work, loading their wagons with rock. But while he was perched in the hills preparing his canvas he witnessed the death of one of them in a blast. In a letter to Roberts, Streeton describes how he watched “6 of ’em carry him past me”, causing him to lament “how full of dread is the grey expression of death”. This painting shows the aftermath: smoke curls up the sides of the gorge, while a chute of dislodged debris tumbles down the centre of the picture. Yet the mining accident is not the main focus: its vertical composition and high horizon diverts our gaze from the solemn stretcher-bearers to the perilous rock face above them. The work is a departure from Streeton’s typically heroic depiction of labourers at work in the landscape. Instead, it registers his concern about the dangers associated with building modern Australia. Streeton experimented with painting evocative horizontal landscapes onto narrow wooden panels. This beach scene, though small, has the immediacy of a plein-air sketch: gorgeous blue waves break onto pristine white sand, while Streeton’s fiery-orange tree branches seem to flicker. But he also gives his landscape a mythical dimension, drawing on the Greek legend of Ariadne, abandoned by her lover Theseus on the island of Naxos. The white sail darting across the horizon suggests Theseus’s flight, while Ariadne broods on the beach. The Australian rural landscape becomes an Antipodean Mediterranean, playing up to growing patriotism in the run-up to independence. In 1888 Russell moved to Belle-Ile-en-Mer, an idyllic island whose coastline and rich flora inspired several impressionists, including Monet. Russell painted a handful of dramatic seascapes in which violent, foamy waves crash against the island’s rocky outcrops and headlands, but this painting of fishing boats at anchor is more subdued. 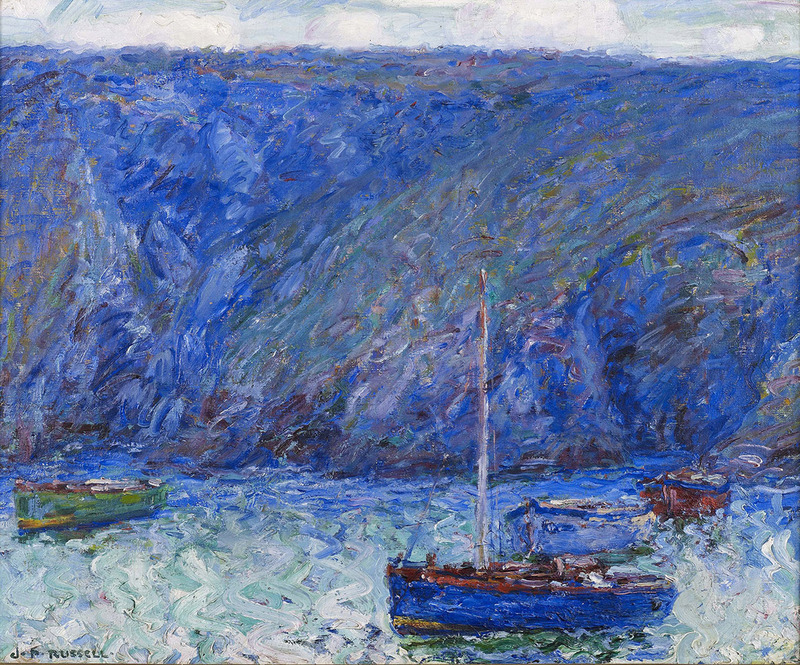 The coastline is assembled from brushstrokes of varying intensity: dabs of electric-blue paint, applied thickly and rapidly, convey the water’s currents, while finer brushstrokes carve out subtle patterns in the dark-blue cliff face that rises sharply out of the water behind the boats. Russell’s non-naturalistic colour palette, developed at Belle-Ile-en-Mer, is a radical departure from the technique of his Heidelberg contemporaries and looks forward to the visionary paintings of fauvists like Henri Matisse and André Derain. Though Russell rarely painted his homeland, he never lost sight of it. He was always eager for Australian artists to see his work, which embodied his conviction that Australian artists should look beyond their country for inspiration. His inclusion in this exhibition should restore this “lost impressionist” to his rightful place in the history of Australian art.